Shower them with sunshine! An abundance of yellow and green blooms bursts from the stylish bamboo box, bringing miles of smiles along with it. What a joyful pick for him and her, any day of the year! 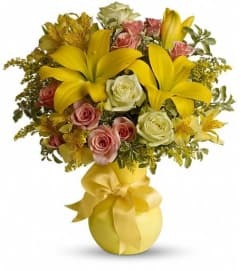 Sunny yellow flowers include roses, asiatic lilies, gladioli and miniature carnations, all mixed with soft green button spray chrysanthemums, carnations and variegated pittosporum. 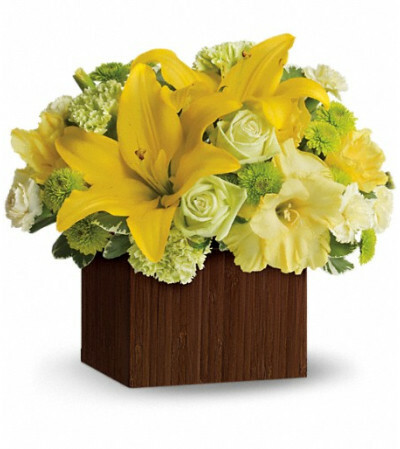 Delivered with a modern touch in a rich brown bamboo box. I ordered a floral piece to be sent to a funeral home and it was absolutely gorgeous....even nicer than the picture on line!!. I would highly recommend this florist to anyone looking to get a great value for a great price! Yes, she loved the flowers. Excellent JOB! Received same-day delivery. Everything was as ordered. 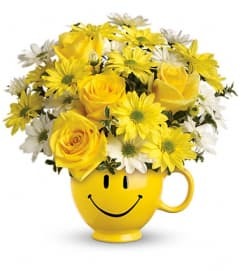 The flowers were beautiful, cheerful and the recipient was happy. Margaret's Florist is a Lovingly Florist in Miller Place. Buying local matters. Discover how Lovingly supports local florists. Copyrighted images herein are used with permission by Margaret's Florist.